UNITED NATIONS, October 16, updated Oct 18 -- At least twice before its mandate expired on July 9, the UN Mission in Sudan transported Ahmed Haroun, indicted by the International Criminal Court for war crimes, to Abyei in UN helicopters. Now even with UNMIS ostensibly gone, the Sudan People's Liberation Movement - North has expressed concern that UN helicopters which are not even supposed to still be in Sudan have been used to transport Haroun over its frontlines to Talodi town. The concern was raised in a letter from the SLPM - North to the UN, a copy of which Inner City Press obtained and then in fairness sought UN comment on, before now putting online. More than 42 hours have passed without the UN providing any substantive response to this troubling allegation. "SPLM/A - North in South Kordofan is concerned about reports of UNMIS flights from and to Kauda, Talodi, Jalud and Kadugli. According to UNMIS own schedule of pulling out, the mandate was supposed to expire on the 31st of August, 2011 or by the first week of September. "As we are seeking your clarifications, our fear and concerns remain that your flights are facilitating Gov. Haroun's movements across SKS and within SPLA's frontlines. Recently it was reported on the the national media Gov. Haroun's recent visit to Talodi town. We have observed no Sudan Armed Forces helicopters flying to Talodi; the only ones we saw were the UN helicopters. So we presume Gov. Haroun flew to Talodi in one of the UNMIS liquidation team helicopter. "Therefore, SPLM/A-N looks forward to your clarification and feedback." "DPKO's response to concerns about it transporting ICC indictee Haroun, including but not limited to Talodi as alleged in the attached SPLA/M-North letter." "On your first question about the transportation, I am seeking further information in order to be able to respond but given the time on a Friday evening I do not expect to have anything before Monday." Inner City Press also asked, "what is the status of the UNMIS liquidation, in light of the allegations in the letter?" Response to this too was put off: "Equally, on the precise stage of the liquidation process, I need to get further information from the field and even when your email came in it would have been too late today to get this." 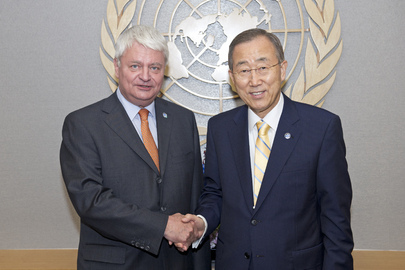 But Ladsous was asked at his belated October 13 press conference about the stage of liquidation. It would seem that DPKO, with a multi-billion dollar budget and over 100,000 armed troops in the field, should be able to answer this question, at least in 40 hours. "what type of investigation of the June 8 Kadugli incidents is the UN calling for? By whom? When? Who were the commanders of the Egyptian peacekeepers there that day, and are or will they work again in UN peacekeeping missions?" "In relation to what kind of investigation the United Nations is calling for, I refer you to the August report of the Office of the High Commissioner for Human Rights." The current UN preaches intermittently about accountability -- mostly be others -- but does not impose it on its own officials or peacekeepers. If and when responses are received they will be reviewed and presented. Watch this site. "I have received further information from our liquidation team on the ground in Sudan on this matter. The UNMIS liquidation team has not flown Governor Haroun on its helicopters. The liquidation process continues, in accordance with the timeline agreed with the Government of the Republic of Sudan." And what about, regarding the murders in Kadugli in June in front of UN peacekeepers -- "Who were the commanders of the Egyptian peacekeepers there that day, and are or will they work again in UN peacekeeping missions?"